We continue working to improve the import of products. The shipping containers are designed for maritime or fluvial transport, land transport and multimodal transport. They are sealed units that protect the goods from the climatology and which are manufactured in accordance with ISO (International Organization for Standardization). Cargo volumes are 100%; i.e. it is m3 of air, which leads to loss of stowage which involves the burden of any type of cargo (15-20% on the volumes that you will see). 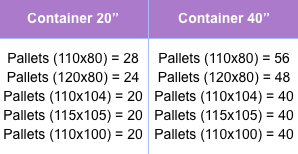 For High Cube containers , check the table below. If you want to know more about the containers, visit our website here. And if you have any questions contact us and we will assist you immediately!